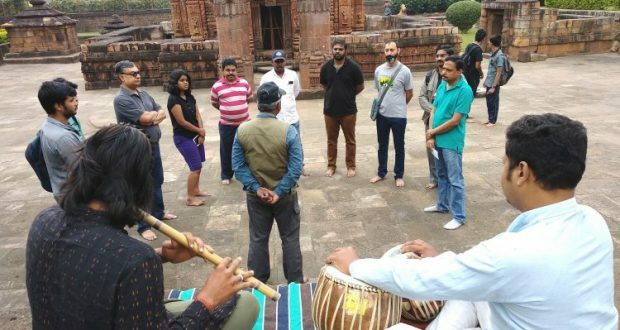 Bhubaneswar:28/10/18: Senior fellows and researchers at Centre for Policy Research (CPR), a Central think tank based in New Delhi, Water, Sanitation and Hygiene (WASH) Institute, and Urban Management Centre Ahmedabad were part of the 97th Ekamra Walks Old Town Circuit, among other visitors from in and around the city. While visiting the Dudhwala Dharamsala the visitors also got an idea of the traditional “Habish” by widows at the heritage inn for budget pilgrims. “Habish” is a traditional observation of religious practice during the month of Kartik, which is supposed to be an auspicious month in the Hindu calendar. The widows not only worship different Gods and Goddesses and take simple food, they also practice the “puja” collectively at the Dharamsala, organised by the Tourism Department.